Jock, the quintessential Pouto man, and mad driver of Pouto Sand Safaris, passed away in August 2016 after a brief illness. Pouto Sand Safaris will not be continuing in his absence. Jock will be missed by all. It was a hair raising adventure with ‘Jock’ a charismatic joker with a sense of humour and a wealth of information on the area as he took you for a ‘hoon’ on his beach buggy along Pouto Peninsula. Up and over huge mounded sand dunes with shifting sands, where the scenery changes regularly as the wind reshapes the dunes. You would see petrified kauri and relics from the past and listening to Jocks stories along the way. Eventually you would arrive at New Zealand’s oldest three storey lighthouse built in 1884 and maintained today by the Historic Places Trust. 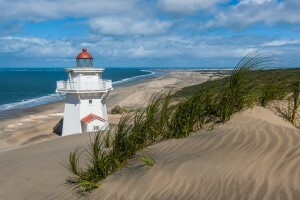 Jock would tell you the history of the area and of its eerie past, it’s offshore area is called the graveyard, because of the many ships that were wrecked on the sand bar as the sailing ships tried to enter the Kaipara Harbour to pick up timber from the regions Kauri forests. Images provided by & copyright: © Ruth Lawton Photography.